For the backend, GWT relies on an RPC system using plain old Servlet. Each RPC service is published as a distinct servlet so you end up having as many servlets are there are distinct RPC services. Not only this approach is not optimal for resources management server-side wise, it also pollutes your web.xml with many servlet declarations. Ideally we should have an unique servlet serving as a router and dispatching RPC calls to appropriate service beans managed by Spring. Spring is an appropriate framework for managing business in the backend due to its industry-wide adoption and its mature extensions portfolio. Needless to say that this design can be easily adapted for JEE containers too. Disclaimer: the code presented below has been inspired from projects like spring4GWT and gwtrpc-spring. I took the same approach and modified the URL mapping part so the original credits go for them. RPC processing with GWT not only consist of calling the appropriate service in the backend. It also involves some plumbing tasks like object serialization/deserialization to pass parameters back and forth. Instead of re-inventing the wheel and re-coding everything from scratch, it is wiser to re-use the existing GWT infrastructure and extends the RemoteServiceServlet class to adapt it to our needs. Let’s analyze the code step-by-step. As private fields, we declare a UrlPathHelper (line 6) to extract paths from URL (necessary to determine which service bean to call) and a map linking a serviceURL to the appropriate Spring bean (line 9). First in the init() method (line 12) we get a reference on the current Spring Web application context. We check for the presence of the “serviceURLMapper” servlet parameter. If it’s set we initialize the map of serviceURL by calling the method initServiceURLMapper() (line 27). This method simply retrieve the map from Spring context. At runtime, when a request is sent to the servlet, the processCall(String payload) method is called. This method is copied from the original RemoteServiceServlet class and I introduced some modifications. The first part of this web.xml is a classical Spring web application context declaration, nothing special. Next we define our special servlet, providing the serviceURLMapper parameter. This value should point to an existing bean id in the Spring context (see below) (lines 17-18). 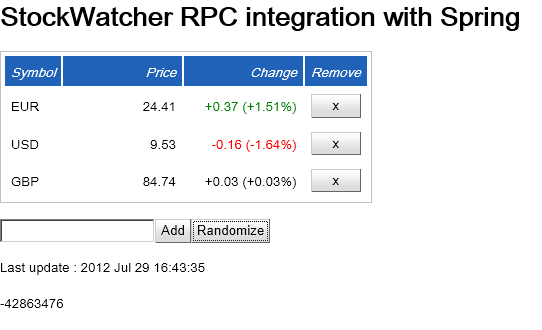 Finally we associate this servlet with the url pattern “/stockWatcherRPC/rpc/*” (line 26). Only RPC calls using this pattern will be handled by our custom servlet. Below is a picture summarizing the way URL are handled by our servlet. 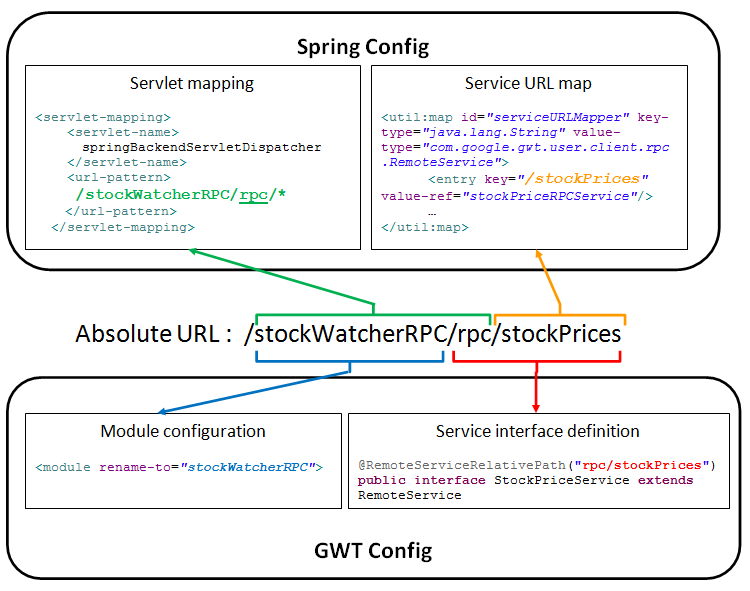 Please notice that the GWT module name (here stockWatcherRPC) should be included in the servlet mapping url. Most of RPC issues come from erronous service URLs. Another remark about URL path segregation. 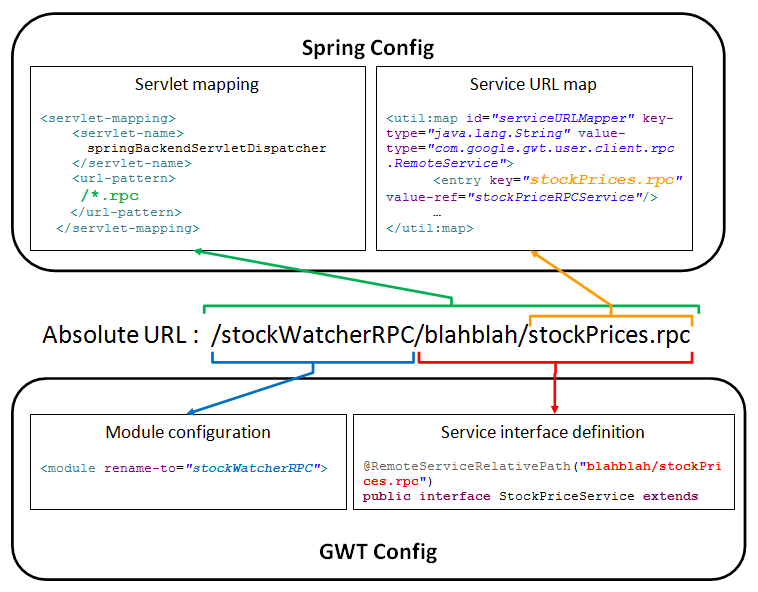 We could have declare the Spring servlet mapping as /stockWatcherRPC/* and the url in the map as /rpc/stockPrices. However associating the Spring servlet mapping to the root of GWT module name (/stockWatcherRPC) is not a good idea because any request from the GUI to retrieve static resources (images, JS files…) will trigger our custom servlet, which we do not want. In the above example, we use the /rpc pattern in the URL string to distinguish between client RPC calls and normal resources requests. But another approach for RPC URL mapping is possible. What if we distinguish all RPC calls with a particular extension, like *.rpc ? this.rpcExtension represents the URL extension for RPC calls (.rpc here). It should be injected in the servlet as init parameter. As a sample application, I took the original StockWatcher from Google tutorial and modified it to use Spring RPC beans in the backend. The main “Add” button is calling the stockPrices service. I enriched the GUI with a “Randomize” button and introduced a new randomize service to demonstrate the servlet URL mapping feature.